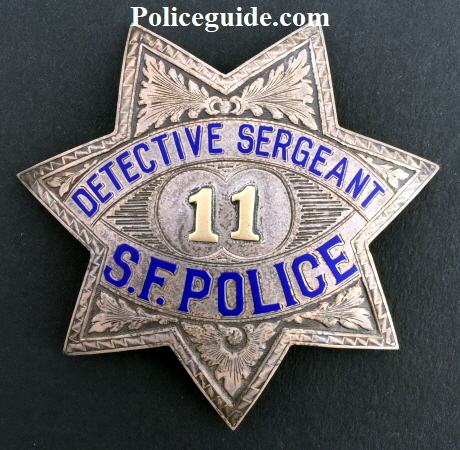 San Francisco Police Detective Sergeant badge #11. 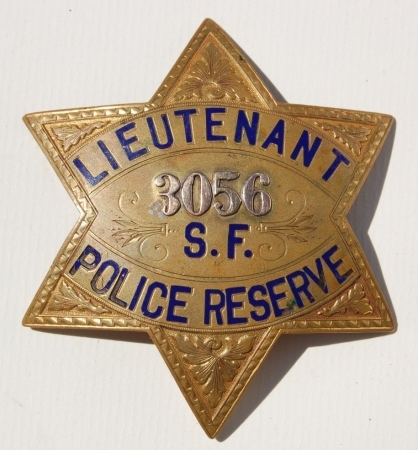 Badge is dated 1932 and hallmarked Irvine & Jachens Mission St. S.F. Sterling. 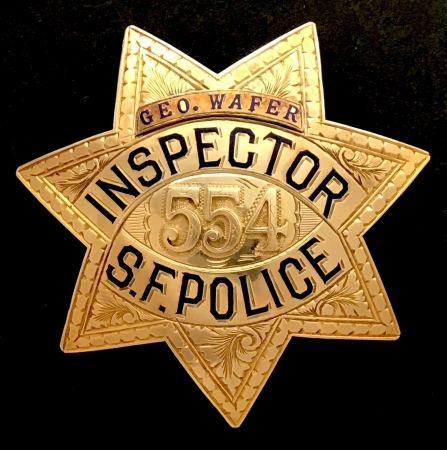 Issue to George P. Wafer who joined the department on 7-2-1923. Read Newspaper Accounts of Wafers Heroics. Irvine & Jachens. 3-2-23. Sterling. 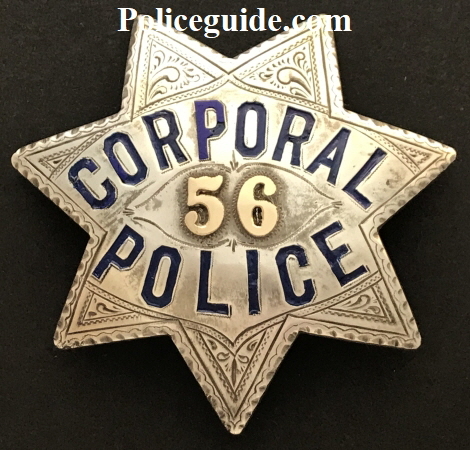 Issued to Cornelius F. Thornton who was appointed 1-31-1921. 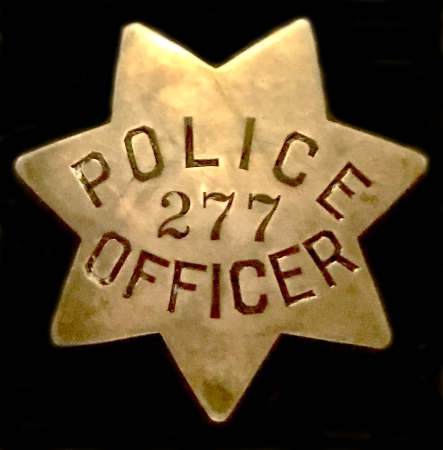 Promoted to Sergeant July 17, 1933. 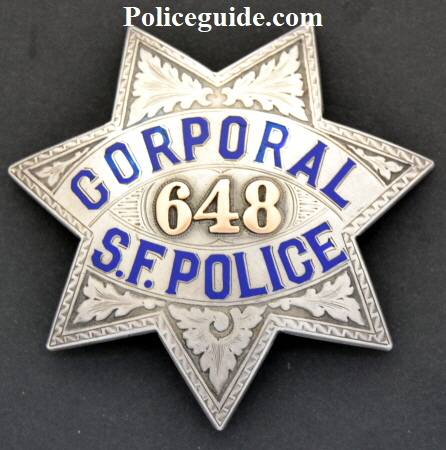 San Francisco Police Corporal badge #648, made by Irvine & Jachens. Badge is Sterling. 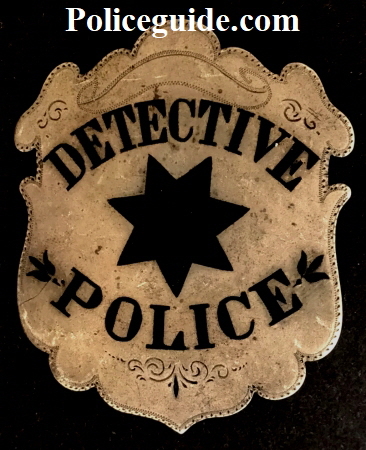 Issued to Archie E. Schmidt who was promoted to Corporal on Jan. 1, 1926 and was first appointed to the force April 13, 1914. Presentation on reverse reads: From Two Dear Friends. 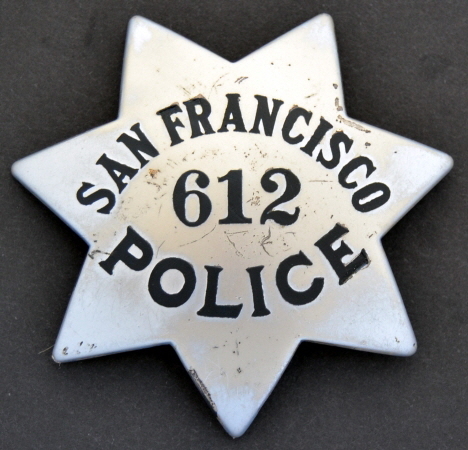 San Francisco Police Officer John Bacigalupi wearing badge #612, was appointed 8-8-21. Made by Irvine & Jachens. 9-1-21. Sterling. to John J. Regallo on 7/1/1908. 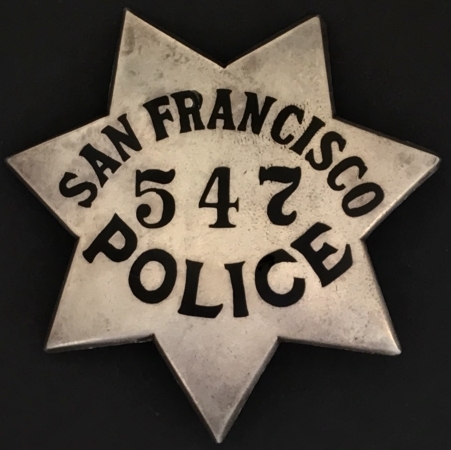 San Francisco Police badge #547 made of sterling by San Francisco’s Samuel’s Jewelers. 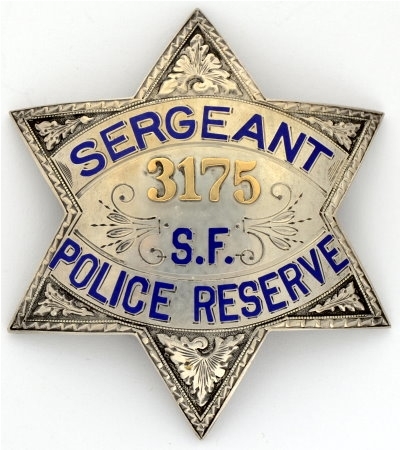 San Francisco Police Reserve Sergeant badge #3175, made by Irvine & Jachens. Sterling. made by Irvine & Jachens Sterling. 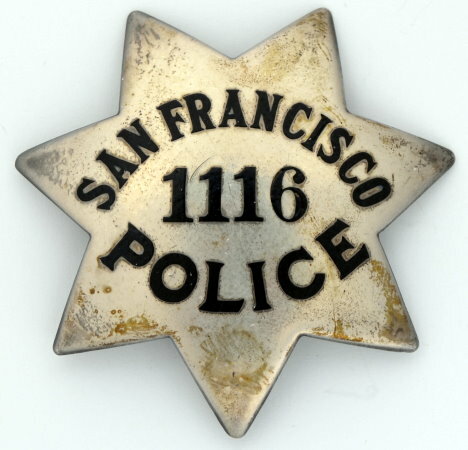 San Francisco Police badge #1116, made by Irvine & Jachens. 11-26-24. Sterling. 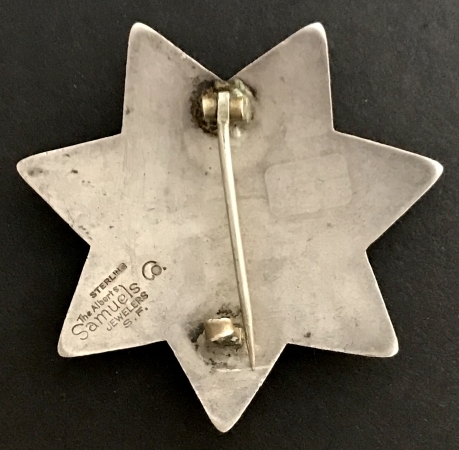 Issued to Eugene J. McCann 12-1-24.
made by Morgen Jewelry S.F. and marked 14k. 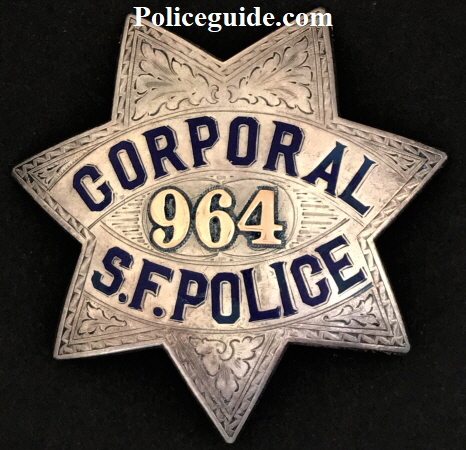 San Francisco Police and Peace Officer’s Journal. 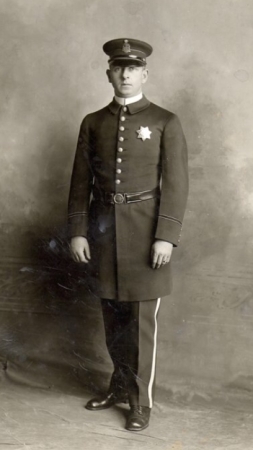 This 1923 image shows newly appointed Officer Geo. P. Wafer. Courtesy of Patty Davis. Frank A. Fontana Born 9 Oct 1870. 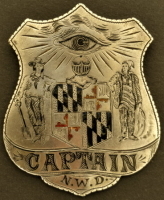 He was appointed to the department on 9-13-1895. The S.F. Call newspaper on Mar. 28, 1902 reports he passed the exam for Corporal and was appointed as such. The same newspaper on the 24 of November 1911 reports he was made a Sergeant . 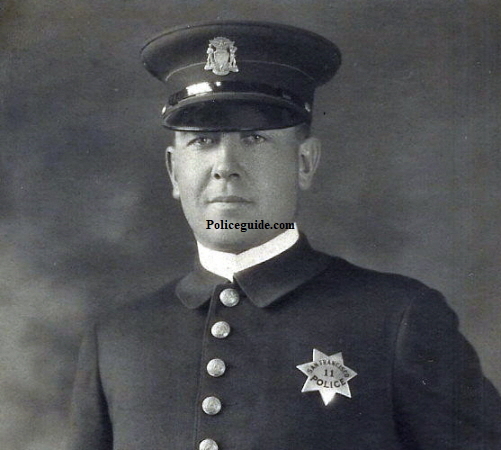 He served 32 years when he retired and passed away shortly thereafter on 2 July 1927. 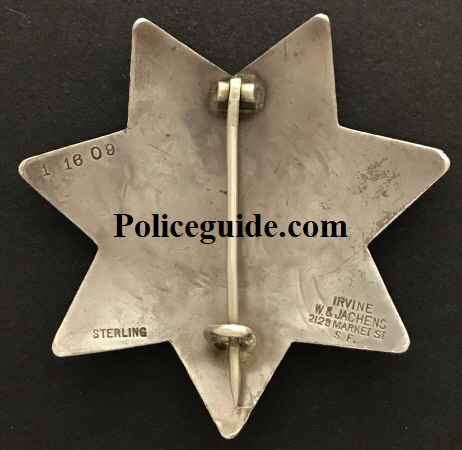 Made by Irvine W. & Jachens 2129 Market St. S. F. Stamped sterling and dated 1-16-09. 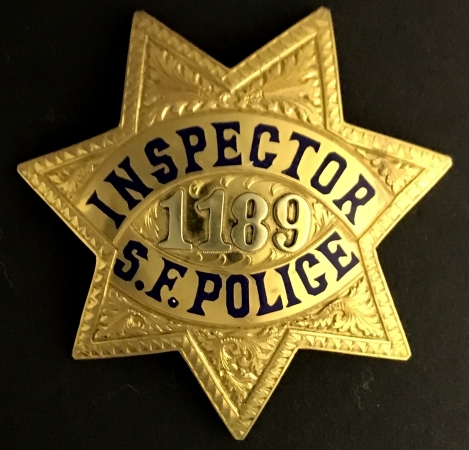 San Francisco Police Detective badge, jeweler made, circa 1880. 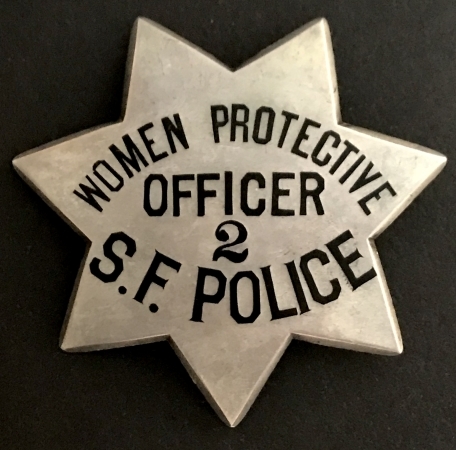 San Francisco Police Women Protective Officer badge #2, made by The Albert Samuels Co. Jewelers S. F.. Sterling. 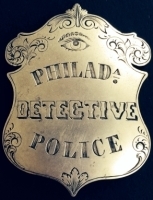 Two women were issued badge #2, Mrs. Belle Love Dec. 19, 1908 and Katheryene C. Eisenhart Oct. 20, 1913. 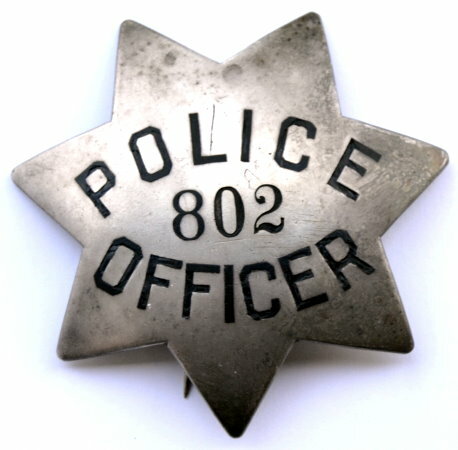 San Francisco Police badge #802 hallmarked Irvine W. & Jachens Market. Dated 6-25-10. Coin silver. Issued to Albert Saemann 12-30-1908. 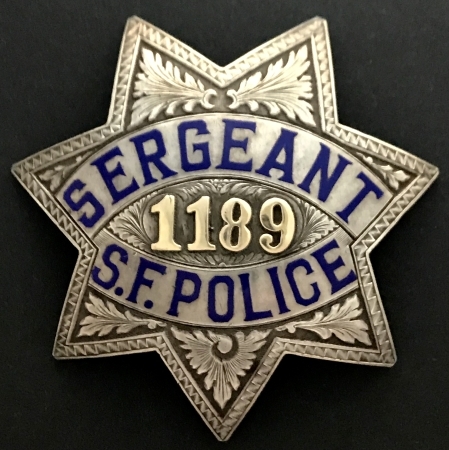 San Francisco Police Officer Thomas A. Burns wore badge #1189 and pictured are his Sergeant and Presentation Inspector badges. Both are hallmarked Irvine & Jachens and the presentation badge is dated 2-20-74. 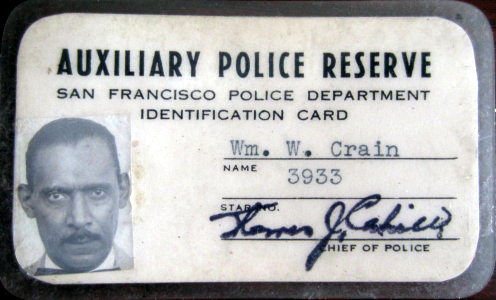 Below is an article telling how Officer Burns saved a child from a crazed man who claimed to be the Zodiac killer. 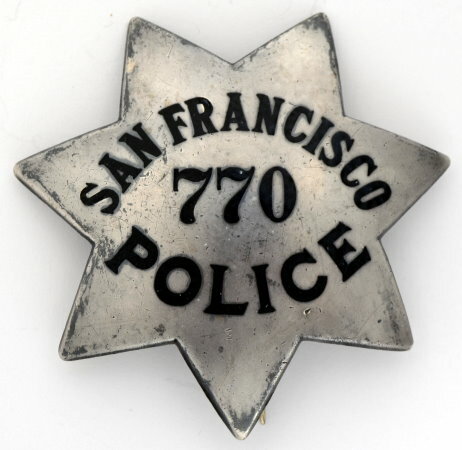 San Francisco Pie Plate badge #277, sterling silver and made by Irvine W. & Jachens, Badge is dated on the reverse 12-31-1907 and was issued to John W. Carlon who was appointed Jan 16, 1908. More interesting heroic deeds by Thomas A. Burns can be read at the following link at the S.F. 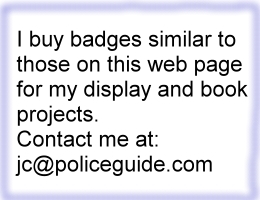 Police Widows’ and Orphans’ web site. Take me there!